Google has announced starting January 2017, Google Chrome will be looking at all websites with any type of web form or login area. If those form pages are not protected with a valid SSL Certificate using HTTPS, a NOT Secure warning will show up and frighten your users away. SSL stands for Secure Socket Layer. The combination of https and the SSL Certificate will create a secure encrypted connection between the users device and the website. This secure connection will make it very hard for hackers to intercept user data that is entered on the website. Up until now, it was recommended to only use a SSL Certificate on a site that was collecting credit card data. Due to the aggressive actions of hackers probing and hacking sites all day, every day, Google has taken the security requirements one step further. We recommend making your whole site HTTPS with a 2048 bit key SSL Certificate. When you do this, you need to update your sitemap and resubmit it to Google Webmaster Tools and / or use the Website Fetch and index feature. You should also put this command into your .htaccess file so that all links on your site automatically redirect to the https: connection. You should then test all your pages to make sure that you did not break anything and that the green bar comes up on every page. If the green bar does not come up, then that page is probably calling up and non secure element. There is an added benefit to having your site https:. In 2014, Google announced that they were giving a small ranking boost to sites that were https:. 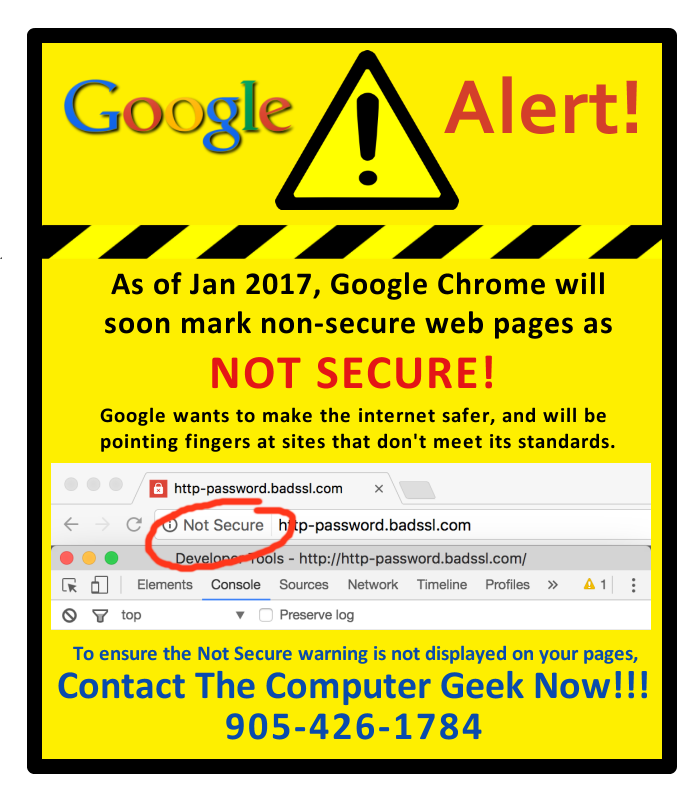 If you have any questions about SSL certificate and the Google Update, please contact us at the Computer Geek. Google is Now Starting to Enforce SSL / HTTPS Starting January 2017 | Computer Geek 5 out of 5 based on 103 user ratings. Google is Now Starting to Enforce SSL / HTTPS Starting January 2017 - Google has announced starting January 2017, Google Chrome will be looking at all webs . . .